Are you participating in the Finish in ’15 Year Long WIP/UFO Challenge? All are welcomed to join at anytime! 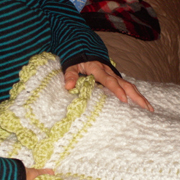 Due to the overwhelming number of photos submitted so far during this final fourth quarter, a second page of photos was crated to show off all the awesome crocheting! 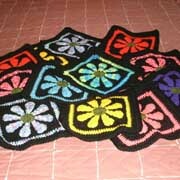 Ellen is making in a bunch of daisy granny squares. 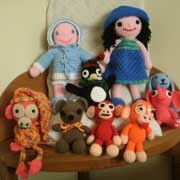 Ellen finished crocheting a lot of dolls and monkeys. 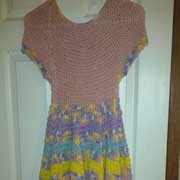 Susanne finished crocheting this dress. 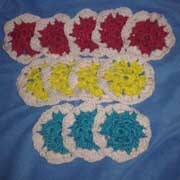 Susanne is working on these hexagon for a stocking. 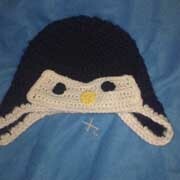 Susanne crocheted this cute penguin hat. 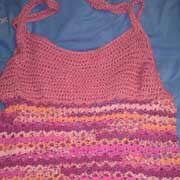 Susanne crocheted this pink tank top for herself. 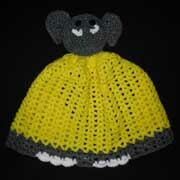 Dody crocheted this cute elephant blanket. 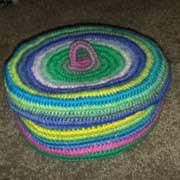 Susanne made this really colorful car seat cover. 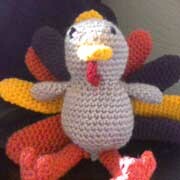 Tanya finished crocheting this adorable turkey. 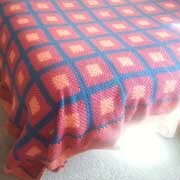 Patricia crochet this pretty afghan with squares. 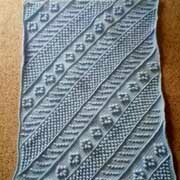 Patricia finished this textured baby boy blanket. 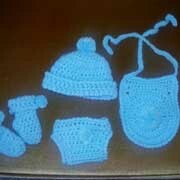 Patricia finished this blue baby boy layette set. 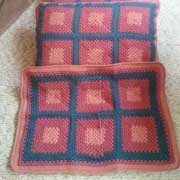 These squares are a blanket in progress by Patricia. 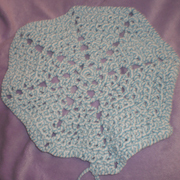 Take a look at this lovely pin Patricia crocheted. 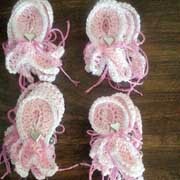 Patricia finished a bunch of pins for breast cancer awareness. 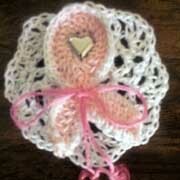 Here are more of Patricia’s breast cancer awareness pins. 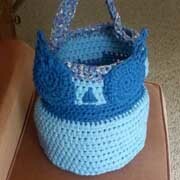 Patricia finished crocheting this owl basket. 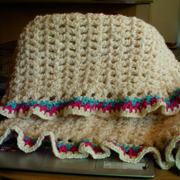 Patricia crocheted these shams to go with an afghan. 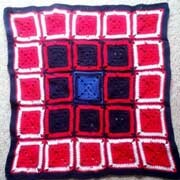 Patricia is working on these squares for a BIG stocking. 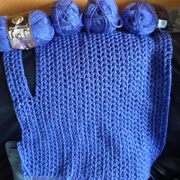 Susanne is working on a sweater for her grandson. 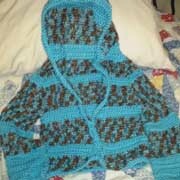 Susanne finished this blue hooded sweater. 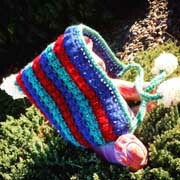 Rachel made this fun colorful, textured purse. 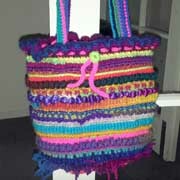 Here’s another colorful bag that Rachel finished. 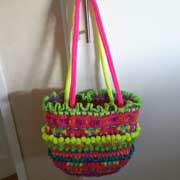 Rachel made this awesome, striped crochet basket. 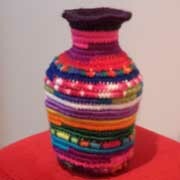 Take a look at this interesting crochet vase made by Rachel. 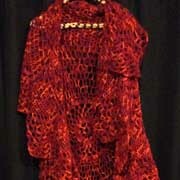 Fiona made this lovely, red Boho vest. 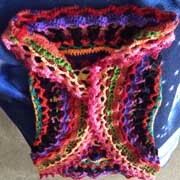 Fiona crocheted this colorful circle vest. 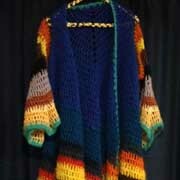 Fiona finished crocheting this coat of many colors. 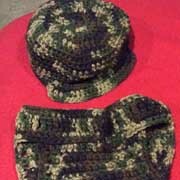 Fiona crocheted this diaper cover and cap set. 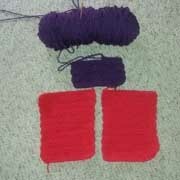 Fiona is working on this purple granny shrug. 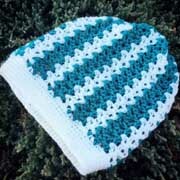 Debbie crocheted this cute, striped beanie. 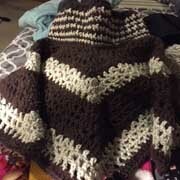 Debbie finished this project when a nice chevron pattern. 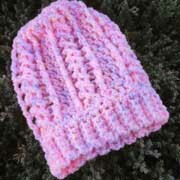 Debbie finished crocheting this pink hat. Debbie made this striped hat with pom poms. 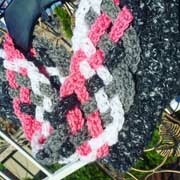 Debbie made this weaved scarf in pink, black, and white. 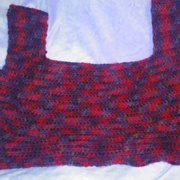 Susanne finished this nifty Christmas tree potholder. 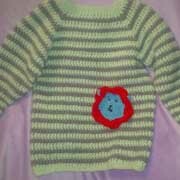 Susanne made this striped sweater for her grandson. 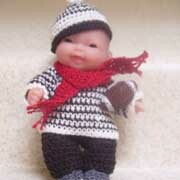 Barbara crocheted this super cute doll outfit. 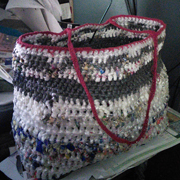 Penny is almost done with her plarn (plastic yarn) bag. 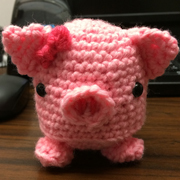 Check out this adorable piglet that Andree crocheted. 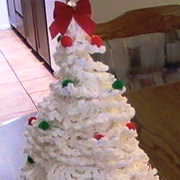 Susanne is working on this dress for Christmas. 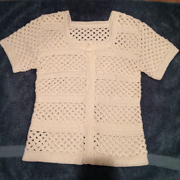 Jane finished this mesh striped cardigan. 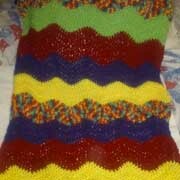 Sandy crocheted this free style baby blanket. 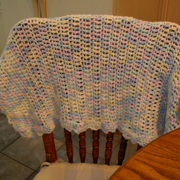 Here is another baby blanket that Sandy crocheted. 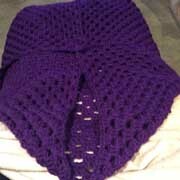 This color cowl is crocheted by Sandy. 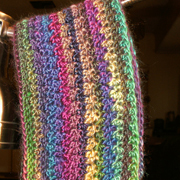 Here is a close up of a wrap that Sandy finished. 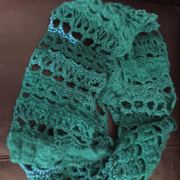 This pretty turquoise scarf is crocheted by Michele. 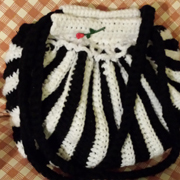 Mary crocheted this black and white striped handbag. 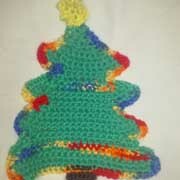 Mary crocheted this lovely decorative tree. 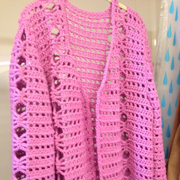 Molly finished this pink cardigan sweater. 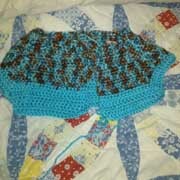 Molly is working on this 2 way crochet vest. 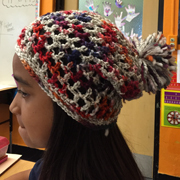 Mali crocheted this multi colored hat with pom pom. 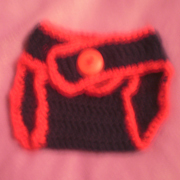 Susanne finished this baby diaper cover for a gift. 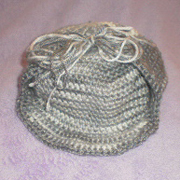 Here is a hat that Susanne is working on for her grandson. 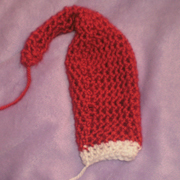 Susanne is working on a preemie sized Santa hat. 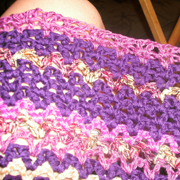 Susanne is making this crochet rug with T-yarn. 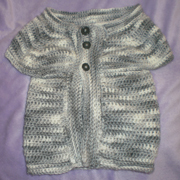 Susanne finished this sweater vest for her grandson. 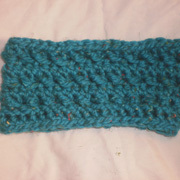 Susanne finished this blue cowl as a gift. 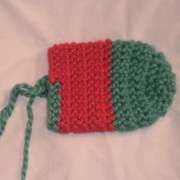 Susanne is working on this Christmas stocking. 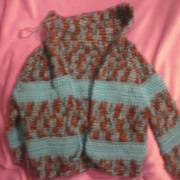 Susanne is working on another sweater for her grandson. 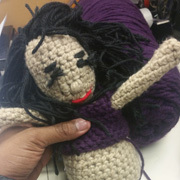 Renee and Michele are working on their doll Chrysanthemum. Don’t see your photo on this page? Check out page #3. This entry was posted on Saturday, November 14th, 2015 at 12:00 AM by Rachel Choi	and is filed under Fun Ramblings. You can follow any responses to this entry through the RSS 2.0 feed. You can skip to the end and leave a response. Pinging is currently not allowed. rachel, I hope that this finds you doing well. I have a ? 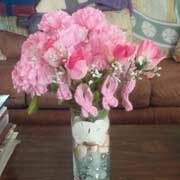 for you because I’m very confused as I am most of the time. (lol). now I may be reading this wrong or misunderstanding something but what I understand is that if we won in any of the other quarters of the Finish in 15 then we could not win anymore. Is that right ? If so that is not right because we should be allowed to enter if we dont even stand a chance at winning! thats the whole point in entering a contest is to win something. I hope you dont think Ive been stal piling all summer because i havent, all the stuff I sent you was totally legit!! Please get back to me because i have beem working really hard on all this stuff!! Hi Susanne, every photo counts as an entry. If one of your photos was selected as a winner in a previous quarter, then that one photo will not be used in future drawings. Other photos submitted are still valid entries. oh i see im sorry I knew I was misreading something, I think that I tried not to send the same pic 2x but you know me. thanks for clarifying that with me Im like a child sometimes. ithank you for all you do!!!! !